If you’ve ever felt like your horse is better dressed than you are, Maybach Equestrian is ready to help your horse one-up you again with their line of luxury equestrian goods. German by design, this high-end brand (best known for their cars) will showcase all of your horse’s best features while you continue to wear jeans so old, the brand doesn’t exist anymore. Check out saddles, bridles, blankets and more by Maybach Equestrian. Buy their stuff from RIDE Bedford. Getting thrown by your horse is no joke, but when he’s about to fall on top of you and crush your skeleton/internal organs at a high rate of velocity, your chances of survival become laughable. Although hard to come by (current fashion: air vests), it has been credited as life-saving during extreme falls. Best suited for: young riders, old riders, riders with young horses, re-riders and basically anyone who isn’t sitting on an automated plastic horse outside a grocery store. Get your country’s flag on there & some bling = stylish. Plus lifesaving. Cool. Buy a Woof Wear EXO Body Protector at VTO Saddlery or Equestrian Collections. Sometimes you just need a little more bling in your life (even if it’s already on your helmet monogram, your gloves, your Animo breeches, need we go on?) and Bliss of London will make those dreams come true. 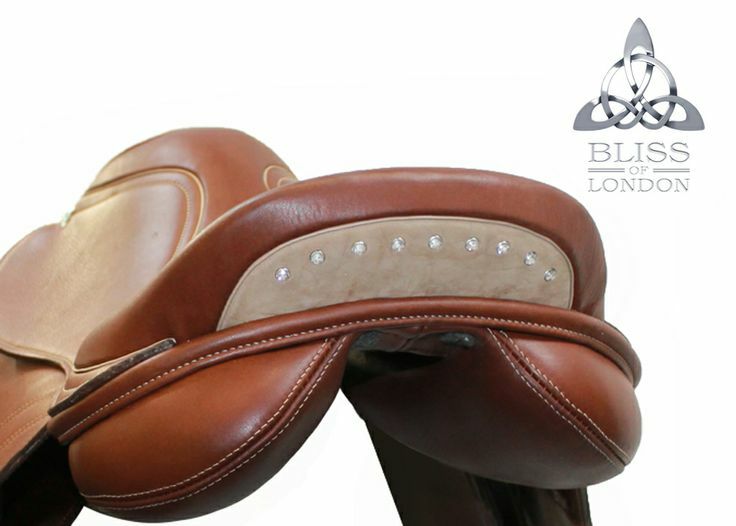 Custom details on your saddle can include anything you can dream up, whether it’s a hint of style for the hunter ring or a splash of color/your sponsor’s logo for the jumper ring. Please have someone PPE your custom design before slapping down that card. You’ve been warned! Learn more about Bliss of London or visit their Facebook page.